Out of habit, I still had an extra home pregnancy kit around. When a pink line emerged indicating a positive result, it took my breath away. “Well, okay; here we go,” I thought. I would be 47 and Mark 48 when the baby was due. At ages 50 and 51, we would have a 3-year-old. Our family numbered 11 since we had recently become legal guardians of a boy from Kenya who we considered a son. I was 44, when our last baby was born; our eighth. He was planned. Some people thought we were crazy and let us know. I suppose other people thought we were crazy and just let other people know. Our seventh child was born when I was forty-two. I like even numbers so eight seemed like a good idea. Of course there were even better reasons such as a new eternal soul and my daughters’ prayers for more siblings. The boys loved the new babies but I don’t think they were as pro-active about it. My husband and I had given up contraception years earlier once we understood that the Church knew a thing or two about marriage, creation, and everlasting life. Still, after forty-four, I had given away most of the baby things. Seventy-two months of being pregnant seemed like enough. That’s six straight years. Throw in nursing and well, that’s a long time. “Hey Mark, we’re going to have another baby,” I announced, showing him the pink line. We looked at each other, wide-eyed. It was a moment of understanding what it meant to truly be pro-life, pro-Catholic, and anti-contraception. In case you’re wondering, we practiced Natural Family Planning in our own special way. Mark was always fine with more babies so it was just me sort of paying attention. And sort of not. Rather than be crushed by popular opinion, we decided the only opinion that mattered was God’s. As for all the money we didn’t have and all the gray hairs we did have—well, what did that matter in the scheme of eternity? 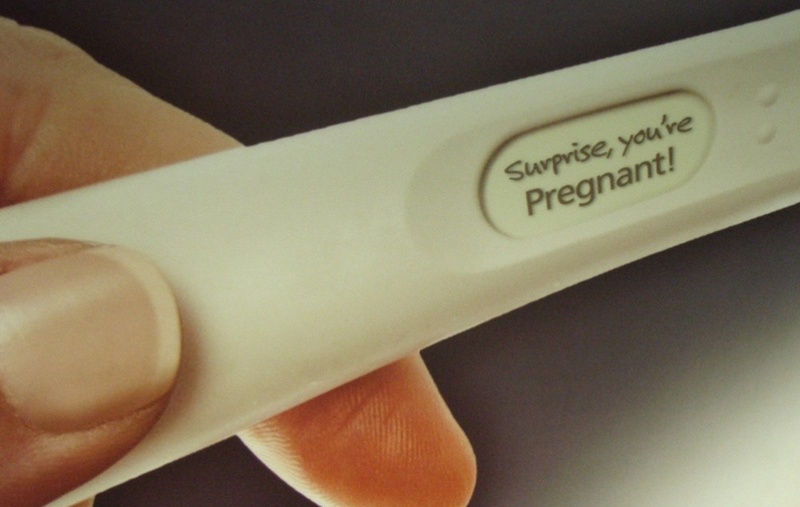 Then, at three months, I miscarried for the first time. I was not sad at first. “Of course,” most people would think, “you were just let off the hook from having a baby at 47.” Yes, there was a part of me still a bit shocked about another pregnancy. But the other part of me had bought a new baby swing and other items at rummage sales to prepare for another baby that we would all love so very much. I had lost the baby on Saturday but by Monday, the loss hit me when I was alone at morning Mass. Before Mass started, I suddenly felt a deep sense of knowing that the baby had been a boy—Matthew—and that he was with God now. Awe and sadness washed over me. There was no greater place for him yet still, Matthew was our only baby that I did not get to hold in my arms. He was the only one not to join his waiting family. Aaron had dreamed two nights in a row of a baby. In the first dream, a baby had died but he was confused. The next night, he had the same dream but this time, when he looked at the baby, he knew it was his little brother. In the dream he looked at me and we nodded at one another because we both knew it was Matthew. “Oh, Aaron, I just asked God this morning to somehow let everyone else know it was a boy.” I explained my own experience to him, marveling at my answered prayer. My oldest had connected with my youngest, from heaven to earth. And so, no one has ever questioned that it was Matthew who we lost–or rather gained. We gained a special intercessor in heaven. The other thought that came to me before I drove away from church that morning, was that we needed Matthew in heaven to pray for the rest of us. As I look back on that whole mystical experience, I have one regret. If I could go back in time, (ten years) there is one thing I would do differently. Rather than avoid another pregnancy, I would be open to life—perhaps even seek it. My health was fine and I recovered quickly. However, after the miscarriage and with my age in mind, I avoided ever getting pregnant again. I was successful. I wish I had not been. We know that this world is passing and in a blink of an eye it will be over and eternity will begin. Yet, we often let the weight of our worldly concerns determine our destiny. It is a beautiful thing that I have a son in heaven that I can talk to and will one day meet. He is in the place I want the rest of us to reach. If we could see heaven with our eyes right now, would it not bring joy to fill it with some of our children as yet unborn? Having children waiting for us in heaven–children that never sinned on this earth and love us perfectly–would be a blessing. And if I had gotten pregnant again and another child was born into this world, love would have flowed from us to him or her and back again. Forever. So what was I was afraid of? The same thing that so many others are afraid of—the world. Rather than see with the mind of God, I saw through my own little brain. I do not beat myself up over this but it is a point I would change if going back in time were possible. I give thanks to God for all 10 of our children on earth, (another son joined us from Kenya) and look forward to meeting Matthew one day. In the meantime, I know he is interceding for us. Lovely story, Patti. How blessed we are to co-create with God! Thank you for sharing your faith journey. I pray that we all continue to grow in wisdom and in grace, through Christ’s mercy.